Nevada’s Pyramid Lake may be famous for its 20-pound Lahontan cutthroat trout, but if you think that’s all fishing the Eastern Sierra has to offer, you’re sorely mistaken. It’s home to many year-round catch and release waters including the Walker and Carson rivers as well as Topaz Lake. We asked the experts at The Angler’s Edge in Gardnerville where they like to fish. Read on for tips from the pros and download our favorite spots to your phone or desktop with this Google Maps List. The Angler’s Edge also does guide trips, fly fishing lessons, and fly-tying classes, as well as being an all around wealth of information, so if you have any questions swim on over. 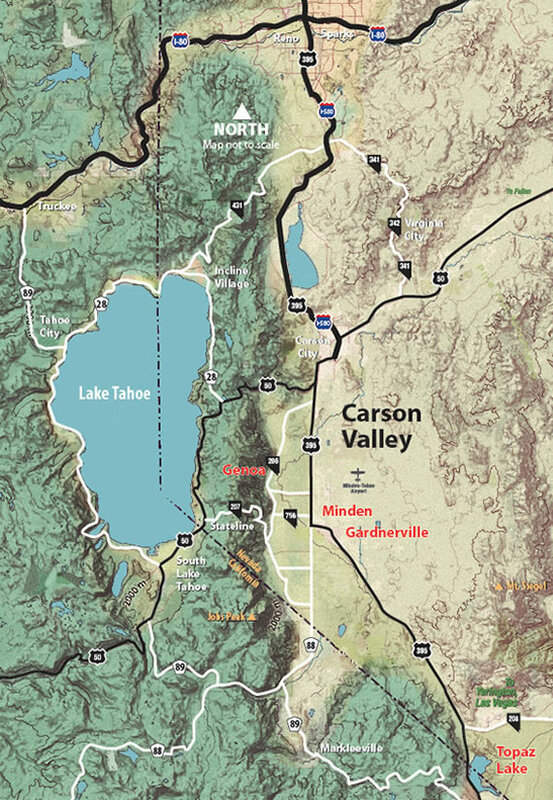 The 205 mile Carson River begins in Alpine County, CA as two cold and untamed tributaries, the East and West forks. The river has two sections, each with their own unique personality. The approachable upper section runs from Wolf Creek down to Hangman’s Bridge near Markleeville, CA while paralleling Highways 89 and 4. The lower section runs from Hangman’s Bridge down through the scenic Carson Valley. This portion stretches between California and Nevada. Fishing the California side of the East Fork offers greater numbers of Rainbows, Lahontan cutthroat, and German browns than the slower moving rivers of Nevada. River access in Carson Valley is convenient and reachable for most types of vehicles. One of the best places to access the river is just a short drive from Lampe Park. To reach the Lutheran Bridge from Highway 395 in Gardnerville, turn west onto Waterloo Lane, then turn south on Centerville Road. Travel for less than 0.1 mile and you’re there. If you gaze at the waters near Ruhenstroth Dam long enough, you can expect to see other anglers and the occasional group of rafters in late spring and early summer early. Just minutes from Gardnerville, this local’s favorite can be found by traveling south past Gardnerville on Highway 395 and turning west about a mile past Lahontan National Fish Hatchery onto Washoe Road. The paved road leads to the river. Beginning in the Sawtooth Range of the Eastern Sierra Nevada, the Walker River is a vital source of water for irrigation and a hidden treasure for anglers. With two distinct forks, the East and West, the Walker River has fishing for all skill levels. The tailwater section of the Walker’s East Fork, known as the Miracle Mile, fishes like its name suggests: small flies attracting large fish. To get there, follow Highway 395 south from Gardnerville for about 60 miles before turning left onto CA-182 north to find the Bridgeport Reservoir. Miracle Mile is just to the north. The river runs along the highway and has many access points and parking spots. South of Gardnerville and between Reno and Mono Lake is where you’ll find Topaz Lake. It borders California and Nevada, making a fishing license from either state valid. Topaz Lake is at its best in the winter and early spring months, while most lakes in the Eastern Sierra are frozen. The Topaz Lodge runs an annual winter fishing derby from January 1 to April 14. Fishing on the lake kicks off on January 1 and closes November 1. Boat rentals are available for on-lake fishing although many locals gather around the outlet on the northeast shore of the lake. Topaz Lake can be found along Highway 395 at the California-Nevada border. Dustin Parker and his son with two tagged fish. If you’re planning on heading out to find your own fishing hole, a fishing license is just as essential as a rod and line. To get your license, stop by the Chevron at Topaz Lodge, Big 5 in Minden, or Walmart on Topsy Lane. Prices vary based on resident status, age, and other factors. One-day fishing permits for Nevada residents begin at $9, one-year passes start at $40. Nonresidents can expect to pay $18 for a one-day permit or $80 for a one-year pass. Visit http://www.ndow.org/Fish/ for more information. Except for some interstate waters (Lake Tahoe and Topaz Lake), anglers 12 years of age and older are required to obtain and possess a license or permit to fish. Nonresident anglers under 12 are not required to have a license, but the number of fish taken must not exceed 50% of the posted limit. For more information on regulations, including catch and release waters, click here. For places to fuel up for your fishing trip check out our Dining Page. Looking for things to do after your successful day on the water? Our What to Do page has tons of ideas for you.